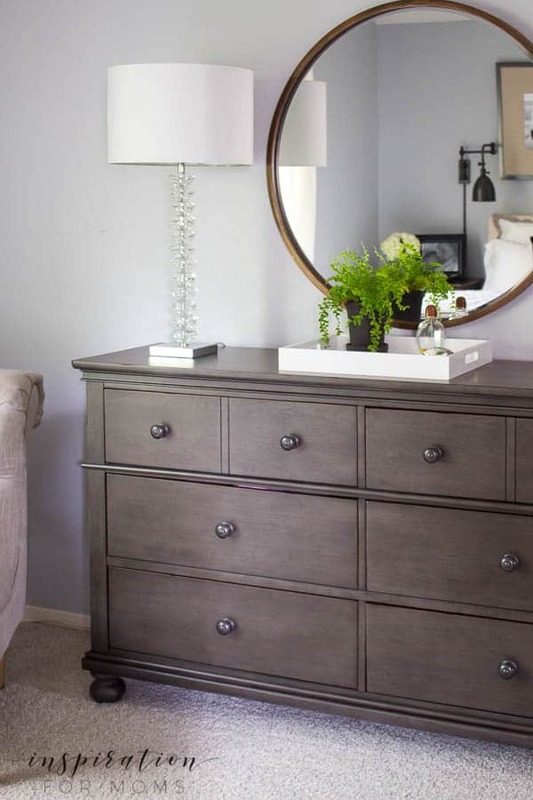 A 90’s master bedroom makes a jump into modern decor with a simple but elegant makeover. 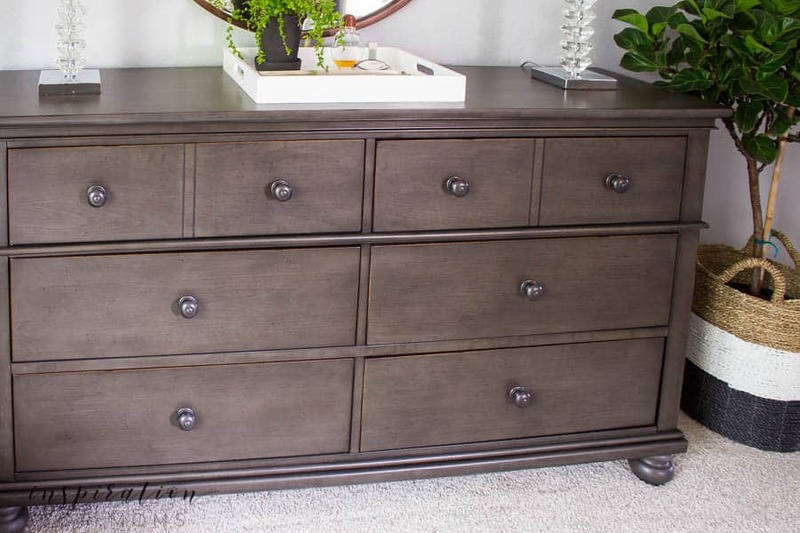 Thank you to American Furniture Warehouse for sponsoring this post. I think before and afters are so much fun! 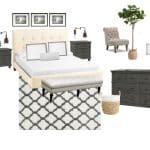 I’m so excited to share with you the finished look because our master bedroom has experienced a big transformation. I shared some pictures with you in my Fall Home tour last week but now I’m showing you the whole master bedroom makeover before + after. But first, let me start with the back story of this room. This home was built in the early 90’s. I’m pretty sure the two previous owners did no updating or changes whatsoever. Seriously. The couple we bought it from said they didn’t even want to repaint it because they loved the colors so much. Well, I can you tell you…I’m definitely leaving a new mark on this house! 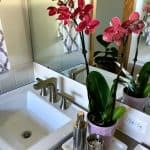 I’ve slowly been making changes to this home to bring a more modern feel to it. The master bedroom has been at the top of the list but my progress in here has been slow. Like we have been in this home for two years now, slow. 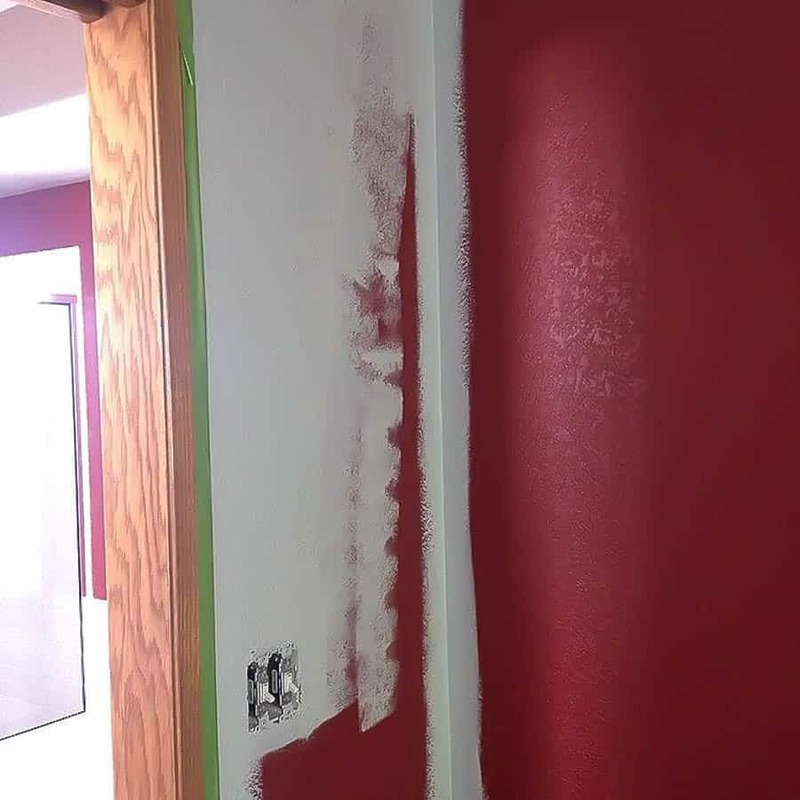 The bedroom was painted a two color combination of brick red and tan. These colors were very popular back in the 90’s. 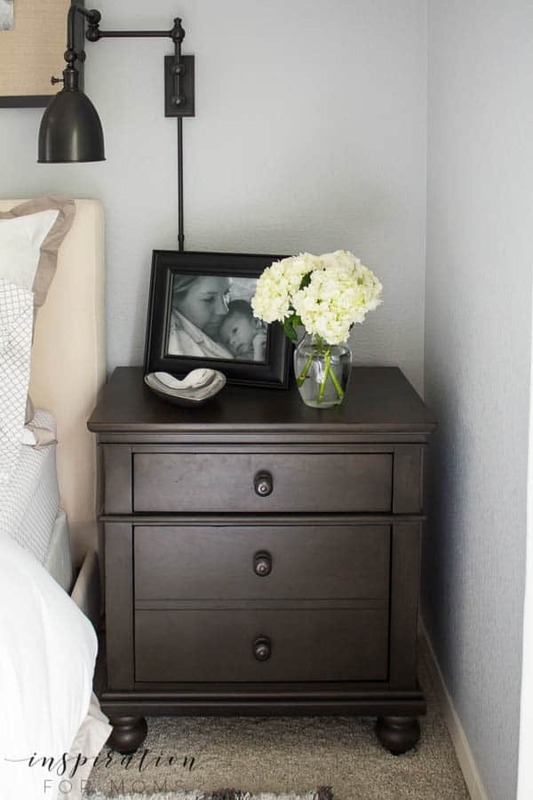 But for our bedroom, I wanted a calming, neutral color that would create a cozy, restful retreat. So the very first thing I did to this space was take down those lace curtains. It had to be done. 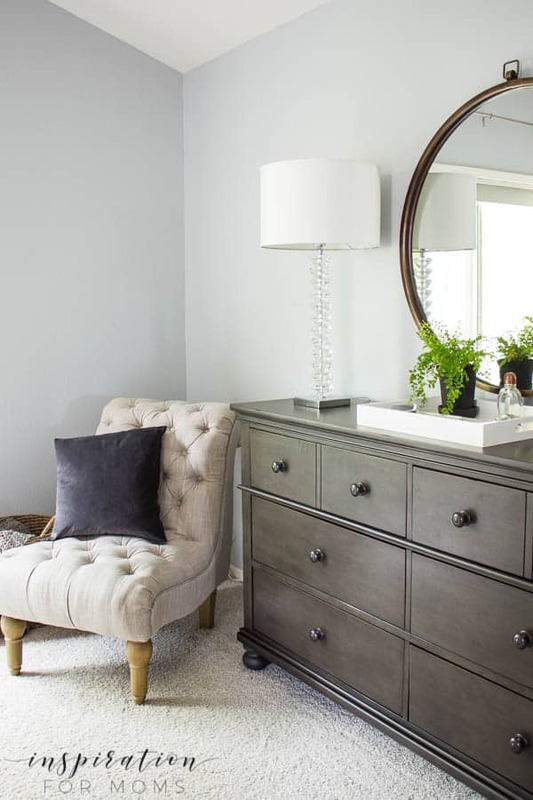 The next was to paint the room a soft gray by Sherwin Williams called Lazy Gray. Why that color? Well, because I want to be completely lazy in this room! 😉 I painted the walls a nice soothing gray color and updated the orange-ish trim with a simple white. Now that the bedroom was painted, it was time to decide on some real bedroom furniture. Currently we only had one night stand (on my husband’s side) and a dresser. The dresser had a few nice sized drawers but about half were super small and totally not useful. I knew exactly what this space needed. 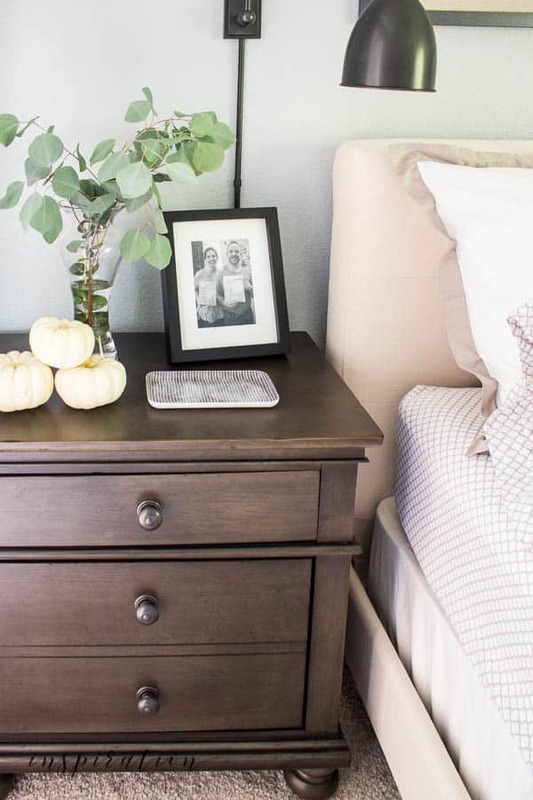 I wanted two nightstands, a large dresser and a side chair to create a cozy corner spot. So I took a visit to American Furniture Warehouse online and found exactly what I was looking for at a great price. We were so lucky to partner with them on this master bedroom makeover before + after and create the bedroom retreat we always wanted! 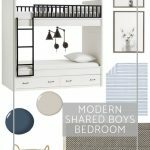 Welcome to our new bedroom…. It’s amazing what some simple paint and beautiful furniture can do to a space! 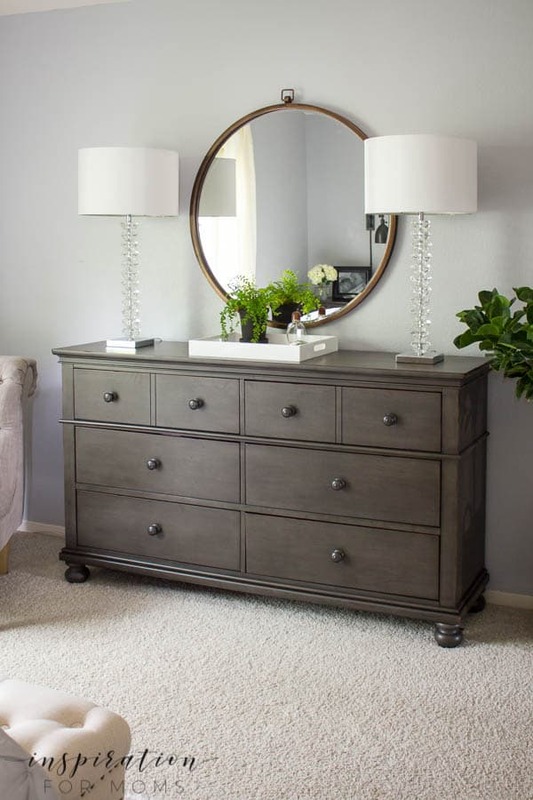 I love the gray color of the new Oxford bedroom furniture. 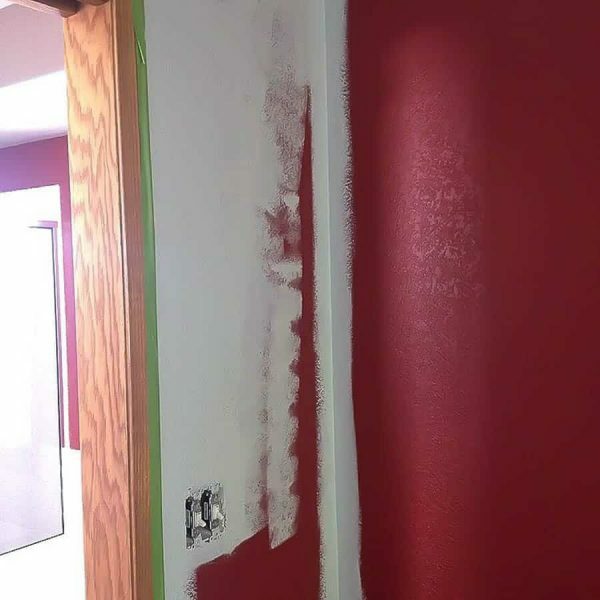 It offers such a nice contrast to the bedroom wall color without being over powering. Just last night, I told Chris how much I love having my very own nightstand. It keeps everything I need conveniently right within hands reach. And I think it’s the perfect place for a pretty bouquet and a very treasured memory of my first born son. Another piece I am so happy I now have is my corner linen chair. 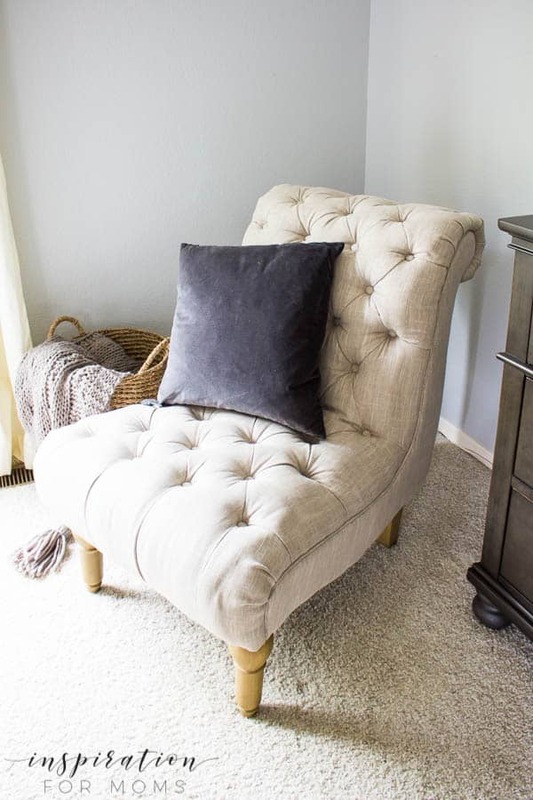 Our bedroom needed a little cozy spot and this chair with a soft throw and gray velvet pillow is absolute perfection. It looks so beautiful next to our new large dresser. This dresser has a crazy amount of storage. We are able to store twice as many clothes than in our previous dresser. The drawers have a really smooth glide when opening and closing, too. 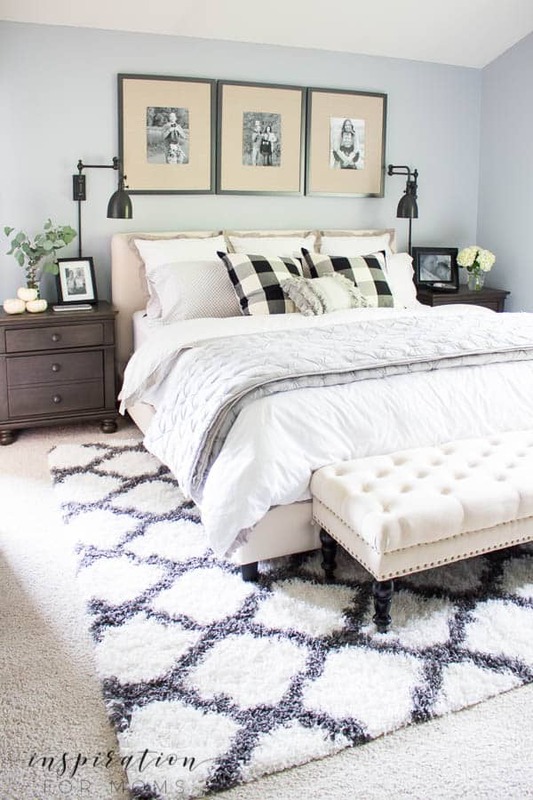 This master bedroom makeover is beautiful now and so relaxing. I just know we are going to love this room for years to come! If you are looking for some new furniture, be sure to check out American Furniture Warehouse. They have several store locations, but also sell and ship furniture online! Love this room!!!!! Really like the buffalo check pillows accompanied with the delicate ruffle on the shams. Also, loving the family photos. Great job again, Laura. It’s so very pretty! The perfect space to relax and unwind after a long day. I love the color scheme you brought to the room so calming, beautiful! Thank you so much, Cristina! I’m really loving my new bedroom retreat. This is AMAZING! 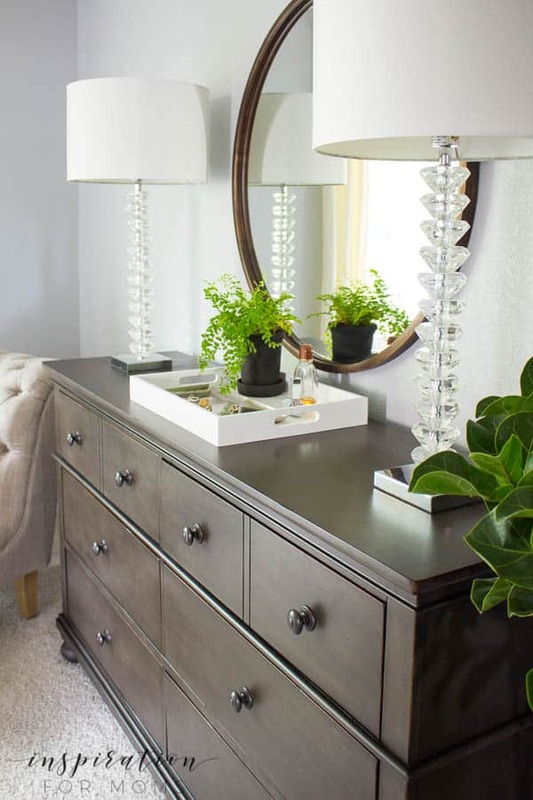 I love that dresser! Pinning now! WOW – what a beautiful transformation! I love the chair a lot . . . and the dresser .. . it’s all awesome! Good job! 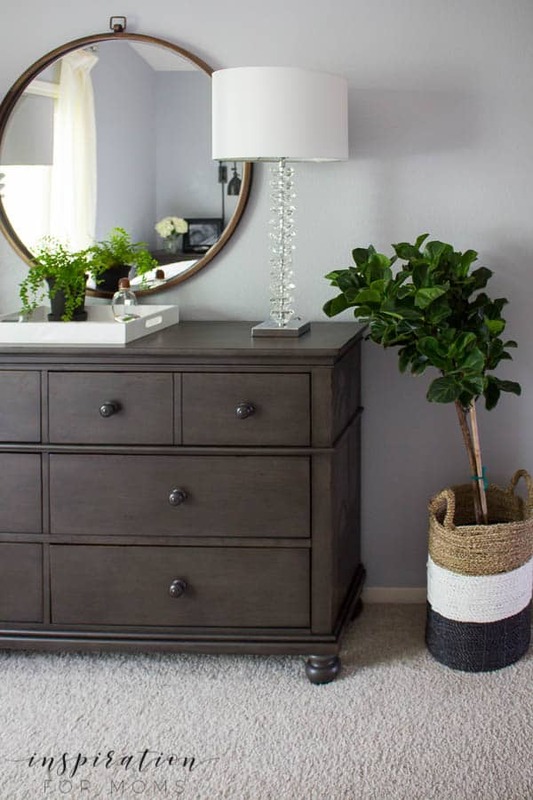 oh wow, the room is just gorgeous, I love that furniture in the beautiful gray color! Need to check them out! Where is the top blanket in the bed from? 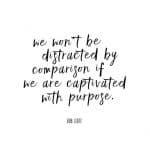 Thanks for the inspo! 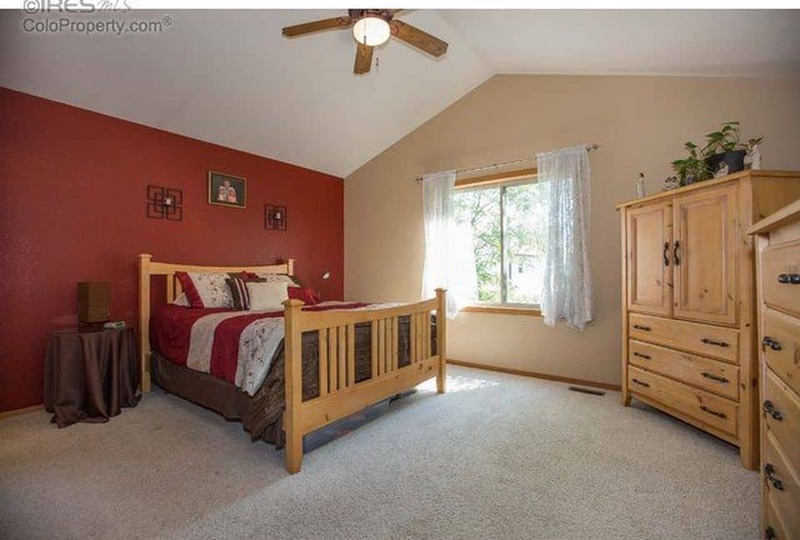 Our new house has this exact same master bedroom layout (and orange wood trim)–oh, the 90s! Definitely stealing some ideas!